Living on campus is safe, convenient and great for your social life. You'll be close to lectures, the libraries and entertainment, and will save money on transport too. There are also shops and laundry facilities on site. What more could you need? 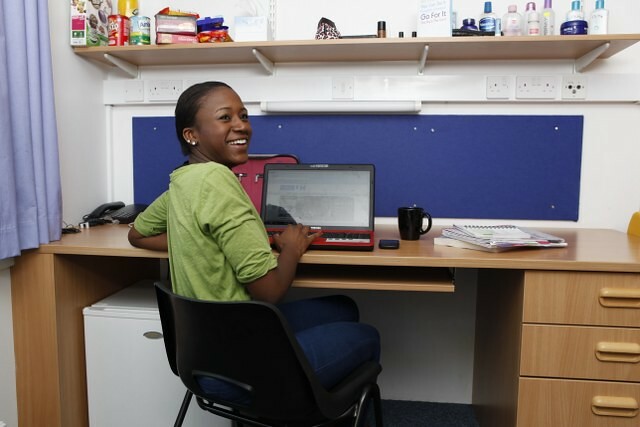 Inside our halls are individual flats for 6 to 12 students, with a choice of single or double bedrooms. These are either en-suite or have shared bathrooms. You’ll share a kitchen but have your own food locker. There are also some single studio rooms, separate to the flats, with their own kitchen and bathroom. Pot noodles not included. You can choose to live on either College Lane or de Havilland campus, regardless of where you're studying. Both campuses offer a great mix of accommodation, all with Wi-Fi. Most students will choose the 42 week option as this will give you plenty of time to complete your studies. If you are an international student, a student on an extended course, or want to stay on campus over the summer then apply for a 50 week contract. Our fantastic new accommodation on our College Lane campus is close to lecture theatres, study centres and social spaces. There is also a gym, social and learning spaces, and a central hub with security and student services. In our College Lane accommodation you’ll have your own bedroom but share a bathroom with one other housemate, and the rest of the facilities with all your housemates. View costs for on campus accommodation. Browse room details - compare specifications by academic year and applicant type. Our de Havilland campus halls are right next to the refectory and learning Resources Centre, Sports Village and the Weston Auditorium, a brilliant film and live performance venue. It means you’ll never be far from lectures, study spaces or places to catch up with friends. *Subject to application deadline and personal needs.